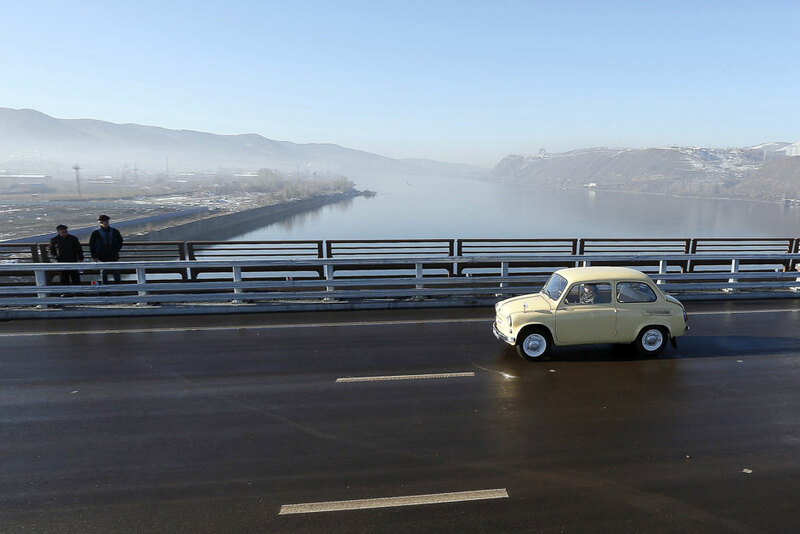 A man drives a Soviet-made Zaporozhets retro car along a new highway bridge during an opening ceremony above the Yenisei River in the Siberian city of Krasnoyarsk, Russia, October 29, 2015. The construction of the 1273, 35-metre-long highway bridge, connecting the M-53 "Baikal" and M54 "Yenisei" federal highways, began in October 2011 and cost about 12 billion Russian roubles, according to local media. The Yenisei divides Siberia between Western (back) and Eastern parts while the bridge serves as a link between them.